ATHENS, Ga. — A break in the forecast allowed the Georgia football team to conduct its workout outside on Thursday, the Bulldogs’ 10th of 15 practices this spring. The full-pads session lasted approximately two and a half hours and included a large contingent of university faculty watching prior to an appreciation dinner in their honor at Stegeman Coliseum. ATHENS, Ga. — The Georgia Bulldogs held their fourth practice of the spring campaign on Tuesday afternoon, working out in full pads. Georgia will continue practice through the Bulldogs’ G-Day game on Saturday, April 20 at Sanford Stadium. 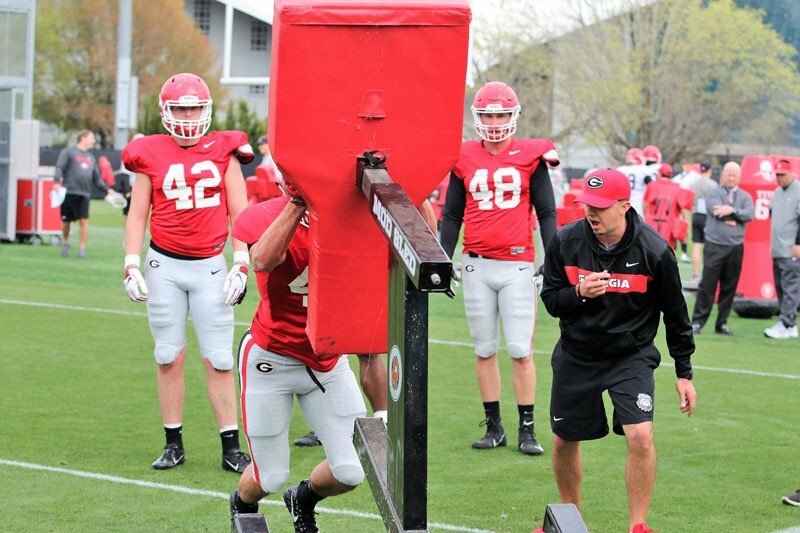 The following are quotes from head coach Kirby Smart and senior defensive lineman David Marshall in media sessions after the workout. “I’ll open up with a comment first about Tyrique Stevenson and Tyler Simmons and then talk about practice a little bit. Obviously very disappointed. There’s a standard of behavior that’s expected of athletes at the University of Georgia and that’s not indicative of the behavior we want at the University of Georgia. It’s very obvious that those guys made poor choices and decisions and they will be disciplined. They will be disciplined internally and to be honest with you, both of them were cited with disorderly conduct which I think you guys know. They’ve got to find a way to make better decisions especially as young men representing this university. Those things will be handled, and they’ll be handled the right way. “I’ve seen hunger out of both of those guys. They don’t know exactly what to do yet, but man they do it hard. There’s something to be said for that. We’re going to play kids at the University of Georgia who give effort and play hard and do the right things. Those two guys, they play hard. They don’t know what they’re doing yet, and that’s our job. I’m very thankful they’re here for (these) 15 practices. I mean Nolan has flashed some plays. He made a helluva hit today and a really good play. He’s also flashed some What are you doing?’ Jermaine has been the same play. We call them ‘Super Man plays,’ where you look out there and say ‘Who is that guy? Who is that jersey number?’ But then they’re lost some too. I’m fired up to coach those two guys because I’m excited about what they’re going to do to the guys in front of them from a pushing standpoint. “It’s really important for us. We’ve got some continuity in secondary, he’s a great leader, he’s very communicative, he is the alpha in that secondary. He says, ‘this is what we’re doing’ and he takes over. He demands guys take notes in meetings. He is what you want. Him staying doesn’t have to do with me. He talked to his dad who is an NFL vet, played a long time. He talked to his mom. I don’t get involved in that decision. I provide information and I get feedback from people I talk to but he made that decision. I’m certainly glad he did. I think he’ll go down as one of the best leaders to come through here because he’s got a chance to be a three-year starter. ATHENS———-James Coley, who served as Co-Offensive Coordinator at the University of Georgia this past season, has been promoted to Offensive Coordinator at UGA according to an announcement Friday by Bulldog head coach Kirby Smart. Coley has been on the UGA coaching staff since Smart took over as head coach in 2016. Coley was named Co-Offensive Coordinator and Quarterbacks Coach at Georgia in 2018 after two seasons coaching the Bulldogs’ wide receivers. He was part of a 2017 staff that led the Bulldogs to a record-tying 13 victories, first SEC championship since 2005, first appearance in the College Football Playoff, first appearance (and victory over Oklahoma) in the Rose Bowl CFP semifinal, and first appearance in the College Football Playoff Championship Game. Georgia’s offense finished first in the SEC and 9th nationally in Rushing Offense (258.4 ypg), 3rd in the SEC in Scoring Offense (35.4 ppg), 5th in Total Offense (435.3 ypg), and 4th nationally in Red Zone Offense (0.964). The Bulldogs followed up in 2018 with another SEC Eastern Division championship, 11-win season, and appearance in the Allstate Sugar Bowl. This past season, the Bulldogs finished first in the SEC in total rushing offense and rushing offense per game, second in the SEC in total offense, touchdowns scored, and scoring offense. Coley’s two seasons of coaching Bulldog receivers produced a pair of NFL draft picks: Isaiah McKenzie (Denver) and Javon Wims (Chicago). In 2018 he coached sophomore quarterback Jake Fromm who posted the second-best Completion Percentage in school history at 67.3, which was 12th nationally, and second-best Passing Efficiency for a QB at 171.21, which was fifth nationally. Coley served as offensive coordinator and quarterbacks coach at Miami from 2013-15. Prior to joining the Miami staff, he held the position of offensive coordinator from 2010-12 at Florida State. The Florida State offenses under Coley were high powered averaging 31.4 points per game in 2010, 30.6 in 2011, and 39.3 in 2012. While at Miami, the Hurricane offense led the nation in “explosive plays” all three years and they produced two 1,000 yards rushers in Duke Johnson (1,652 yards in 2014) and Joe Yearly (1,002 in 2015). Coley coached freshman quarterback Brad Kaaya who earned Freshman All-America honors and broke the single season record for passing yards at Miami. Wide receiver Allen Hurns, currently with the Dallas Cowboys, broke the single season receiving record with 1,162 yards in 2013. A native of Miami, he served as an offensive assistant with the Miami Dolphins in 2005-06. His coaching resume also included a stop at 2003 national champion Louisiana State University where he served as a graduate assistant coach. Sony Michel: Michel had 18 carries for 116 yards and a touchdown and an 11-yard kickoff return as the Patriots clinched their 10th straight AFC East title. Michel is 14th overall and fourth among rookies with 881 yards rushing, 19th overall and fourth among rookies with six rushing touchdowns, sixth among rookies with six total touchdowns, and 10th among rookies with 36 points. David Andrews: Andrews started at center and helped New England roll up 390 total yards. Isaiah McKenzie: McKenzie had two punt returns for 12 yards and an 8-yard catch for Buffalo. Benjamin Watson: Watson had a 6-yard reception for the Saints, who clinched home-field advantage throughout the playoffs. Nick Chubb: Chubb had 19 carries for 112 yards and caught two passes for three yards for the Browns. Chubb’s 972 rushing yards this season are the most ever by a Browns rookie, eclipsing Trent Richardson (950 yards in 2012) and Jim Brown (942 in the 12-game 1957 schedule). Chubb stands ninth overall and second among rookies in rushing yards, eighth overall and third among rookies with eight rushing touchdowns, 15th overall and second among rookies with 10 total tackles, and sixth among rookies with 60 points. Geno Atkins: Atkins posted two tackles for the Bengals. He is 17th in the NFL with 10 sacks. Atkins was named last week to his seventh career Pro Bowl, making him the most recognized defensive player in Bengals history. Shawn Williams: Williams had six tackles for Cincinnati. Williams stands sixth in the NFL with four interceptions. Cordy Glenn and Clint Boling: Glenn and Boling started at left tackle and left guard, respectively, helping the Bengals pick up 209 total yards. Ben Jones: Jones started at center and helped the Titans accumulate 291 total yards. Roquan Smith: Smith led the Bears with nine tackles, including a sack among his two for loss. Smith is 13th overall and third among rookies with 116 tackles and is fourth among rookies with five sacks. Leonard Floyd: Floyd had a tackle and two quarterback hits for Chicago. Ramik Wilson: Wilson had three tackles for the Rams. Todd Gurley: Gurley was inactive for Los Angeles with a knee injury. Gurley leads the league with rushing touchdowns (17) and total touchdowns (21), stands second with 1,251 yards rushing, and is third with 132 points. Last week, he was chosen for his third Pro Bowl. Corey Moore: Moore logged 17 special teams plays for the Colts but did not have any stats. Lorenzo Carter: Carter had two quarterback hits for the Giants. Carter is 14th among rookies with three sacks. John Jenkins: Jenkins had five defensive plays for New York but did not have any stats. Alec Ogletree: Ogletree was inactive for the Giants due to a concussion. Ogletree is fifth in the league with five interceptions. Abry Jones: Jones had two tackles for Jacksonville. Reshad Jones: Jones picked up seven tackles, including one for loss, and a quarterback hit for the Dolphins. Maurice Smith: Smith returned from the practice squad to log 17 special teams plays with no stats. Jordan Jenkins: Jenkins had one tackle for New York. Jenkins is fifth in the NFL with two fumble recoveries. Thomas Davis: Davis had six tackles for Carolina. He is fifth in the NFL with two fumble recoveries. Matthew Stafford: Stafford went 18-of-32 for 116 yards for the Lions. He is 15th in the NFL with 3,511 passing yards and 18th with 19 touchdown passes. Chris Conley: Conley caught three passes for 54 yards for the Chiefs. Justin Houston: Houston had three tackles, including a sack among his two for loss. He is fifth in the NFL with two fumble recoveries. ATHENS, Ga. – As the No. 5 University of Georgia football team conducted Thursday practice in preparation for a meeting with the No. 15 Texas Longhorns in the Sugar Bowl, the Bulldogs also reveled in the success of a 2019 signing class. After an 11-2 regular season and a second-straight SEC Championship appearance, the Bulldogs are headed to the Sugar Bowl in New Orleans, Louisiana in the New Year. The future is bright. In New Orleans, senior Jonathan Ledbetter will play his last game in a Bulldog uniform before joining outside linebacker D’Andre Walker and long snapper Nick Moore at the Reese’s Senior Bowl on January 26 in Mobile, Alabama. At the Team Gala this year, Ledbetter was named a team captain, voted on by the players, and received the Vince Dooley Defensive Player of the Year honor alongside senior cornerback Deandre Baker and the Defensive Up-Front Award with Walker. Sophomore inside linebacker Monty Rice will join Ledbetter as a leader of the defensive attack at the Sugar Bowl. Despite battling injury this season, Rice tallied up the second-most tackles on the year, and will continue to pace a defensive front that finished 2018 ranked 15th nationally in scoring defense, allowing just 18.5 points per game. In the midst of the Sugar Bowl preparation, Georgia welcomed a 2019 signing class to the mix, a group littered with young talent that will make a difference in Athens as soon as January. The Sugar Bowl is slated for an 8:45 p.m. ET start time at the Mercedes-Benz Superdome. The contest will be aired on ESPN. ATHENS, Ga. – Following a two-hour practice on the Woodruff Practice Fields Wednesday afternoon, head coach Kirby Smart met with media and discussed the University of Georgia’s 2019 signing class as well as previewed the upcoming Sugar Bowl against the Texas Longhorns. Georgia signed a total of 20 recruits on Wednesday, the first day of the Early Signing Period. The Sugar Bowl will take place New Year’s Day at the Mercedes-Benz Superdome in New Orleans. Kickoff is set for 8:45 p.m., ET, on ESPN. “Practice has been really good the last couple days. A lot of enthusiasm the first two days of the week. We did a lot of 3rd-downs, special teams, fundamentals, good-on-good, back-to-your-basics, and the guys really competed hard. We had some good competitions out there. We went ones on twos, twos on ones, ones on ones, twos on twos; we practiced a lot of guys. It was good to get the new guys – the new four guys out there competing a little bit. And then today, we introduced something called ‘Texas,’ and started implementing some of the game plan things while also still working on good-on-good and special teams. So, guys have been great, had good energy at practice. I’m pleased with the leadership and the enthusiasm out there. Tramel Walthour DL 6-3 280 Hinesville, Ga. Hutchinson C.C. High School: Walton, coached by Daniel Brunner…Selected to play for Team East at the 2019 All-American Bowl…247sports.com five-star prospect…Ranked as the #34 prospect nationally, #6 wide receiver nationally, #7 player in Georgia…PrepStar Magazine five-star prospect, #8 prospect nationally, #1 ranked WR and a member of the Top 150 Dream Team…ESPN.com four-star prospect, #33 prospect nationally, #4 WR nationally, #6 player in Georgia…Rivals.com four-star prospect, #55 prospect nationally, #9 WR nationally, #8 prospect in the Georgia…Accumulated 52 total touchdowns and over 3,500 yards of total offense in his Walton career…Named to the 2018 Atlanta Journal Constitution Preseason Super 11…Helped lead Walton to a 10-2 record, a top 20 ranking in the state, and an appearance in the quarterfinals of the 2018 Class 7A state playoffs…As a senior, caught 60 passes for 1,052 yards and eight touchdowns, while gaining 216 rushing yards on 53 carries for 10 touchdowns…Named “Back of the Week” by the Touchdown Club of Atlanta after his game-winning 11-yard touchdown run in week four… Member of Marietta Daily Journal Dynamite Dozen…Participated in Nike’s The Opening 2018 Finals…As a junior, he helped the Raiders to an 11-1 record and a second round appearance in the Class 7A state playoffs…Caught 52 passes for 900 yards and seven touchdowns, while adding 270 rushing yards on 38 carries for 10 touchdowns his junior season…Named 2017 All-State 7A Honorable Mention offense by the GSWA and AJC…As a sophomore, named to the MaxPreps 2016 Football Sophomore All-American Second Team offense, GSWA All-State 7A Honorable Mention in addition to All-Region (4-7A)…Tallied 59 catches for 904 yards and eight touchdowns in his sophomore campaign…Earned offensive MVP honors at the U.S. Army All-American Bowl national combine…As a freshman, named to MaxPreps 2015 Football Freshman All-American First Team offense after recording 41 catches for 795 yards and eight scores…Played club 7vs7 football for Hustle Inc. 7v7 in 2018…Also competed on the varsity baseball team during his sophomore year…Played youth travel baseball with fellow Georgia signee Ryland Goede for the 643 DP Cougars, according to an article by the Marietta Daily Journal….Son of former NBA All-Star Mookie Blaylock. High School: Trinity Christian School, coached by Troy Williams…Selected to play in the 2019 Under Armour All-America Game…247Sports.com four-star prospect…Ranked as the #66 overall prospect nationally, #3 safety nationally and #11 prospect in the state of Texas… PrepStar Magazine five-star prospect, ranked #48 nationally, #3 SAF, and a member of the Top 150 Dream Team…ESPN.com four-star prospect, #31 nationally, #3 safety, #6 in Texas and #7 in the Midlands…Rivals.com four-star prospect, #89 nationally, #6 safety and #12 in Texas…Led the Tigers to a 10-0 regular season, followed by four straight wins in the playoffs to secure Trinity Christian’s second-straight TAPPS Div. II State Championship…Earned a selection to the 2018 TAPPS Division II All-State First Team defense…Finished with 85 tackles (46 solo) and 13 TFLs in his senior season…Had 2 INTs, 2 FFs and 1 FR for a touchdown…Also added 45 punt return yards on 2 attempts…Transferred to TCS after playing his first three seasons at Everett High School in Massachusetts…Honored as the USA Today 2017 Massachusetts Defensive Player of the Year…Named to the Boston Herald 2017 All-Scholastic Team as an EHS honor roll student…Led Everett towards back-to-back MIAA Division I State Championships his junior and sophomore seasons with a combined 25-2 record over that span…Amassed 65 tackles, two interceptions, two fumble recoveries and two blocks (1 FG, 1 Punt) in his junior season…Helped EHS to a 9-1 record and a quarterfinal appearance in the MIAA Division I State Playoffs as a freshman…Compiled a 48-3 record in his high school career. Junior College: Georgia Military College, coached by Bert Williams…247Sports.com four-star JUCO prospect…Ranked as the #6 JUCO prospect nationally, #2 ranked JUCO cornerback and #1 JUCO prospect in the state of Georgia…PrepStar Magazine four-star prospect, #4 ranked JUCO prospect, #1 ranked CB…,ESPN.com four star prospect, ranked #7 JUCO prospect overall and #2 CB in the ESPN JC Top 50…Rivals.com #14 JUCO prospect nationally…Team captain of the Georgia Military College team… Led Georgia Military defense that allowed 159.6 passing yards per game and 16.8 points per game…Hauled in two interceptions in his second season… In his first season, blocked three kicks and tied for a team-high three interceptions…Part of a Bulldog secondary that finished 2017 ranked in the top-10 in the NJCAA in INTs…Former Georgia Military College teammates include North Carolina State junior CB Kishawn Miller, Appalachian State junior DB A.J. Beach, and South Carolina junior defensive tackle Jabari Ellis. High School: Spalding, coached by Nick Davis…Helped advance the Jaguars to the second round of the 2016 GHSA High School Playoffs in two-straight years, including a 10-2 record his junior season. High School: Wevika HS, coached by Rich Bedesem…Selected to play in the 2019 Under Armour All-America Bowl…247Sports.com four-star prospect…Ranked as the #4 outside linebacker nationally, the #78 overall prospect nationally and the #11 prospect in Florida…PrepStar Magazine four-star prospect, #57 nationally, #5 OLB, and a member of the Top 150 Dream Team…Rivals.com four-star prospect, ranked #125 nationally, the #4 ILB and #13 in the state of Florida…ESPN.com four-star prospect, #106 nationally, #10 OLB and #16 in Florida…Made three tackles for loss and two sacks in the first four games of his senior before suffering a torn ACL…Wekiva finished with an 11-2 record and reached the FHSAA Region 1-8A championship…Named to the Maxwell Football Club’s 2018 National High School Defensive Player of the Year watch list in the preseason…Selected to represent Team Elite in Nike’s The Opening 2018 Finals…Touted as Orlando’s “most coveted recruit” by the Orlando Sentinel…Spent his freshman season at Wekiva, then moved to the Houston area and played three different positions (DE, OLB, RB) for Clear Lake HS his sophomore and junior seasons…Tabbed to the UIL Class 6A All-District 24 team both seasons at Clear Lake…Made 94 total tackles, 15 tackles for loss, 13 quarterback hurries, six pass deflections, two interceptions and two fumble recoveries for touchdowns (both in the first quarter of the Clements game) as a junior in 2017…Registered 52 total tackles and nine quarterback hurries as a sophomore… Also competed in the discus throw and shot put for the Clear Lake and Wevika track and field teams…Nicknamed “Trouble”… Plans to enroll early. High School: Horn Lake HS, coached by Brad Boyette…Honored as the 2018 High School Butkus Award recipient, given to the nation’s top high school linebacker…Selected to play in the 2019 Under Armour All-America Game…Also selected to represent his state in the 2018 Alabama-Mississippi All-Star Game…Chosen as the 2018-19 Gatorade High School Football Player for the state of Mississippi… 247Sports.com five-star prospect…Ranked as the #1 inside linebacker nationally, #14 overall prospect nationally and the #1 prospect in Mississippi…PrepStar Magazine four-star prospect, #13 nationally and a member of the Top 150 Dream Team…Rivals.com five-star prospect, ranked #19 nationally, #1 ILB and #1 in Mississippi…ESPN.com four-star prospect, #23 nationally, #3 OLB, #11 in the Southeast and #1 in Mississippi…Listed at No. 15 on the USA Today Chosen 25 during the preseason…Helped lead Horn Lake to an undefeated 15-0 season, a No. 1 state ranking (MaxPreps) and the 2018 MHSAA Class 6A State Championship…The title comes as Horn Lake’s first in program history after the team had never advanced past the second round in the playoffs and went 2-10 in 2015, Dean’s freshman season…Awarded as 2018 Mississippi Mr. Football for Class 6A…Recognized as the 2018 National Lineman of the Year by the Touchdown Club of Atlanta…Listed as one of five candidates for the USA Today 2018 Southwest Defensive Player of the Year…A consensus All-American in the 2018 preseason, with first team honors bestowed by USA Today and MaxPreps…Also tabbed for the Clarion-Ledger 2018 Dandy Dozen in the preseason after being named “Five to Watch” for the award a year prior…Made 175 total tackles to rank top five in the state of Mississippi. along with 26 tackles for loss, seven sacks, three interceptions and two forced fumbles in his senior season…Also played running back for the Eagles, rushing for nine touchdowns…Selected to represent the Team Elite team in Nike’s The Opening 2018 Finals…Tallied 147 total tackles, 25 tackles for loss and nine sacks as a junior…All told, he racked up 438 total tackles, 61.5 tackles for loss, 18 sacks, six interceptions and 12 total touchdowns in his Horn Lake career…A rare quadruple-sport athlete at HLHS, competing for the varsity baseball, basketball and track and field teams at different points in high school…Older brother, Nikolas, plays tight end at Ole Miss. High School: Kennesaw Mountain, coached by Caleb Carmean…247Sports.com four-star prospect…Ranked as the #6 tight end nationally, #196 overall prospect nationally and the #23 prospect in Georgia…PrepStar Magazine four-star prospect, ranked #162 nationally, #6 TE, and a member of the Top 350 All-American Team…ESPN.com four-star prospect, the #4 TE and #17 in Georgia…Rivals.com four-star prospect, ranked as the #11 TE and #29 in the state…All-time career leader in receptions, reception yards and touchdown catches at Kennesaw Mountain…Selected to the All-Region 3-7A First Team offense as a senior and a junior…Had his senior career cut short by an ACL tear suffered in October…Listed to the 2018 Marietta Daily Journal Dynamite Dozen in the preseason…Selected to represent Team Boomin’ at Nike’s The Opening 2018 Finals…Named to the USA Today 2017 All-USA Georgia Second Team offense…Hauled in 21 passes for 228 yards receiving and four touchdowns as a junior…Moved into the all-time record books at KMHS prior to his senior season, ranking No. 3 in receptions (60), No. 4 in reception yards (665) and No. 2 in touchdown receptions (8)…Committed on National Signing Day (Feb. 2018) at the Sports and Social in Smyrna, bolstering Georgia’s 2019 class…First loves were golf and baseball and did not enjoy football until middle school…Intends to play baseball at Georgia and was named to the 2017 Perfect Game 16U All-American second team at third base. High School: Eden Prairie HS, coached by Mike Grant…247Sports.com three-star prospect…Ranked as the #105 Weakside Defensive End prospect and the #11 prospect in Minnesota…Rivals.com two-star prospect. High School: Lebanon HS, coached by Chuck Gentry…247sports.com three-star prospect, #29 strong defensive end nationally, #13 player in Tennessee…Rivals.com four-star prospect, #20 SDE nationally, #6 player in Tennessee…PrepStar Magazine four-star prospect, #348 nationally, #27 DE….Helped lead Lebanon to its best season since 2004 with an 8-3 record and a trip to the 2018 TSSAA Division I Class 6A Playoffs…Captained LHS to its first winning record since 2006 and launched a turnaround from a 1-10 season in 2016…Tallied 57 total tackles, including six for loss, while adding an interception, fumble forced and one reception – a 19-yard touchdown – in his senior season…Paced a tenacious Blue Devil defense which held opponents to 11 points per game in the regular season, a program-best since the mid-1980s according to the program’s website…Listed as No. 7 on The Tennessean Dandy Dozen, a collection of top-12 college football prospects in Nashville area. High School: Clinch County, coached by Jim Dickerson…247Sports.com four-star prospect…Ranked as the #7 inside linebacker nationally, #122 overall prospect nationally and the #13 prospect in Georgia…PrepStar Magazine four-star prospect, #75 nationally, #3 ILB, and a member of the Top 150 Dream Team…ESPN.com four-star prospect, #77 nationally, #2 ILB and #10 in Georgia…Rivals.com four-star prospect, ranked #193 nationally, #19 athlete and #19 in the state…Helped lead Clinch County to a 13-1 season and the Class A-Public State Title in 2018, the team’s third state championship in four years…Named to the AJC 2018 Preseason Super 11, the only player selected from a classification below AAA…Consensus selection to the 2017 All-State Class A-Public First Team defense by the AJC, GSWA and GACA South…Recognized as the 2017 Co-Defensive Player of the Year in Region 2-1A…Accumulated 23 tackles and four sacks as well as 974 rushing yards and 20 touchdowns despite missing most of his junior season…Starting inside linebacker at Clinch County who also played quarterback and fullback on offense…Compiled a 49-6 career record at CCHS. High School: Oak Park HS, coached by Greg Carter, a former All-American baseball player at Kentucky State…Selected to the Elite 11 Finals, the nation’s most prestigious quarterback camp for high school prospects…Joins Georgia sophomore quarterback Jake Fromm and former Bulldogs Aaron Murray, Matthew Stafford, D.J. Shockley and five more Georgia alumni as Elite 11 participants…247Sports.com four-star prospect…Ranked as the #9 pro-style quarterback nationally, #7 player in Michigan and #261 overall prospect nationally…Rivals.com four-star prospect…Ranked as the #102 prospect nationally, the #2 dual-threat quarterback and #4 prospect in Michigan…ESPN.com four-star prospect, ranked #299 nationally, #15 QB-DT, #24 in the Midwest and the #6 prospect from Michigan…Led the Knights to a 9-2 overall record and a perfect 6-0 record in the Oakland – White League as a senior, winning the opening round of the MHSAA Division 2 state playoffs before falling to eventual champions De La Salle Collegiate in the second round…Completed 62.5 percent of his passes in 2018 for 1,509 yards and 20 touchdowns through the air, with 305 yards rushing as well according to 247Sports.com…Shined in the summer camp circuit at the Rivals Championships Series camp in Columbus and at Nike’s The Opening Regional in Cleveland…Threw for over 3,000 yards and rushed for over 700 yards with 26 touchdowns accounted for in his junior season according to 247Sports.com…Helped Oak Park to a 30-15 record in his high school career, including back-to-back nine-win seasons in 2017 and 2018…A towering quarterback prospect at 6-foot-6, 205 lbs. …Also a dominant forward on the Oak Park varsity basketball team. High School: Brunswick, coached by Sean Pender…247sports.com four-star prospect, #235 prospect nationally, #22 offensive tackle nationally and the #25 player in Georgia…PrepStar Magazine four-star prospect, #249 prospect nationally, #26 OT, and a member of the All-Southeast Team…Rivals.com four-star prospect, #18 OT nationally, #16 player in Georgia…ESPN.com four-star prospect, #292 prospect nationally, #32 OT prospect nationally, #34 prospect in Georgia…As a junior in 2017, named to the Atlanta Journal Constitution All-State Class 6A Team, Georgia Sports Writers Association Class 6A First Team Offense and First-Team All-Region 2-6A…Anchored the Pirates line that averaged 42.3 points per game in 2017 …Selected to represent Team Overdrive in Nike’s The Opening 2018 Finals and was named to the 247Sports Opening Finals Dream Team with an unofficial 9-5 record in the OL/DL Challenge…Also played basketball, helping lead the Pirates to the Sweet 16 of the 2018 GHSA Class 6A State Tournament as a junior and the 2017 GHSA Class 6A State Championship Game as a sophomore…Nephew to Willie McClendon, a Brunswick High standout who precluded Herschel Walker at Georgia, rushing for 2,228 career yards and 22 touchdowns from 1976-78 before playing four seasons with the Chicago Bears…Cousin to Bryan McClendon, the current offensive coordinator at South Carolina and former assistant coach and starting wide receiver on the 2005 SEC Championship team at Georgia. High School: University School, coached by Daniel Luque…247Sports.com four-star prospect…Ranked as the #179 overall prospect nationally, the #10 running back prospect nationally, #10 RB, and the #25 prospect in Florida…PrepStar Magazine four-star prospect, ranked #196 nationally and a member of the All-Southeast Team…ESPN.com four-star prospect, ranked as the #229 overall prospect nationally, the #13 RB prospect nationally, and the #36 prospect in Florida …Rivals.com four-star prospect, ranked as the #112 overall prospect nationally, the #6 RB prospect nationally, and the #15 prospect in Florida…Recorded 1,345 rushing yards on 199 carries to go along with 19 rushing touchdowns in addition to catching 12 passes for 164 yards and a touchdown out of the backfield in his senior season…Named Top Performer by the Sun Sentinel in week two for 165 rushing yards and four touchdowns against Immokalee…Listed at No. 2 among Broward area recruits in the Sun Sentinel Top 19 for 2019…Selected to represent Team Overdrive in Nike’s The Opening 2018 Finals…Accumulated 1,261 yards rushing and 14 touchdowns in his junior campaign…Earned consecutive selections to the Miami Herald All-Broward Class 5A-Independent First Team offense as a junior and sophomore…Tallied 1,214 yards of offense as a sophomore in his first season primarily at running back…Named to the MaxPreps 2015 Freshman All-American First Team defense as a DB…Also was a small forward for University’s basketball team…Younger brother of current New York Giants defensive lineman and former Miami Hurricanes standout, RJ McIntosh. High School: Franklin Road Academy, coached by Bill Whittemore…247sports.com three-star prospect, ranked as the #28 defensive tackle nationally and the #14 prospect in the state of Tennessee…Rivals.com four-star prospect, #19 DT nationally, #9 player in Tennessee…PrepStar Magazine three-star prospect and #23 DT nationally…ESPN.com three-star prospect and the #33 DT in the nation…Helped the Panthers to an 8-5 record, making it to the TSSAA Division II Class AA state semifinals…Named The Tennessean Nashville All-Region Division II-AA Middle Defensive Player of the Year in 2018…Listed as No. 9 on The Tennessean Dandy Dozen, a collection of top-12 college football prospects in Nashville area…As a junior, named The Tennessean Nashville All-Region Division II-AA Middle Co-Defensive MVP and to the Tennessee Football Coaches Association All-State Team…In 2017, he tallied 74 tackles including 11 for a loss and three sacks…Also competed on the wrestling team in the 285 lbs. weight class, grabbing third place in the 2018 TSSAA State Wrestling Championships as a junior with a 17-2 record…During his sophomore campaign, he finished fifth at the state wrestling meet. High School: Christian Brothers HS, coached by Thomas McDaniel…Selected to play in the 2018 AutoZone Liberty Bowl…247Sports.com four-star prospect, #8 strongside defensive end prospect nationally and the #3 player in the state of Tennessee…PrepStar Magazine four-star prospect, #103 ranked prospect nationally, #11 DE…ESPN.com four-star prospect, #121 nationally, #14 offensive tackle prospect and #3 in Tennessee…Rivals.com four-star prospect, #240 nationally, #21 OT and #7 in Tennessee…Helped lead CBHS to an 8-3 record and the second round of the 2018 TSSAA Division II Class 3A state playoffs…Named as a finalist for Tennessee’s Mr. Football Award in 2018…Honored as the 2017 Tennessee Titans Mr. Tennessee for Class 3A his junior year and was named a semifinalist for the award this year…Selected to the 2018 Division II Class 3A All-Region First Team defense by league coaches…Recorded 55 tackles (10 for lost yards) and six sacks for the Purple Wave in 2018…Tabbed for the USA Today 2018 Preseason All-State First Team defense for Tennessee…Led the Purple Wave to an undefeated regular season, a 12-1 overall record, a No. 7 ranking in Tennessee and a semifinals appearance in the 2017 TSSAA Division II Class 3A state playoffs as a junior…Reached the quarterfinals of the state playoffs in all four seasons at Christian Brothers and compiled a 40-11 career record…Also a four-year member of the Christian Brothers varsity basketball team…Goes by “Bill”. High School: IMG Academy, coached by Kevin Wright…One of four finalists for the Anthony Muñoz Lineman of the Year Award, given to the nation’s top senior offensive and defensive lineman and presented at the All-American Bowl Awards Show on Jan. 4th, 2019…Selected to play in the 2019 All-American Bowl…247sports.com five-star prospect, top-ranked prospect nationally…PrepStar Magazine five-star prospect, #2 prospect nationally, #2 WR…ESPN.com five-star prospect, #2 prospect nationally, #2 defensive end prospect nationally, #1 prospect in Florida… Rivals.com five-star prospect, #5 prospect nationally, #2 WDE nationally, #2 player in Florida…Helped the Ascenders to a 7-1 record, amassing 47 tackles, 14.5 for a loss and 6.5 sacks in his senior season…Listed at No. 2 on the USA TODAY Chosen 25 during the preseason …As a junior, he had 41 tackles, 10 TFL, four sacks, two fumbles recovered, an interception, a fumble forced and a blocked punt…Named to the 2017 MaxPreps Junior All-American Team First Team offense…Selected to represent Team Boomin’ at Nike’s The Opening 2018 Finals, winning the Nike Football Rating Championship with a score of 141.75 (4.55 40-yard dash, 42’2” vertical jump, 4.08 short shuttle and 44’6” powerball throw)…Was also named to the 247Sports Opening Finals Dream Team with an unofficial 9-9-1 record in the OL/DL Challenge…Finishing high school at Calvary Day School in Savannah, Ga., where he spent the first two years of high school…Transferred to IMG Academy after his sophomore campaign at Calvary Day, coached by Rick Tomberlin, where he played defensive line and running back…Named 2016 Atlanta Journal Constitution Region 3-A East Player of the Year…Also was named to the 2016 All-State Class A-Private First Team defense by both the Georgia Sports Writers Association and Atlanta Journal Constitution…Additionally, named All-Savannah Morning News First-Team defense and 2016 MaxPreps Sophomore All-American Team Second-Team defense…Aided the Cavaliers to a 10-1 record with a Class A-Private quarterfinals finish…Defensively, he amassed 75 tackles – 16 for a loss – to go along with 27 quarterback hurries, 12 sacks, three forced fumbles, a fumble recovery and a blocked punt as a sophomore…Offensively, he led the team with 712 rushing yards and scored 12 total touchdowns…As a freshman at Calvary in 2015, coached by Mark Stroud, he helped lead the Cavaliers to an appearance in the Class A-Private playoffs and a 9-2 final record…He ran for 696 yards and 14 touchdowns, while tallying 36 total tackles – 11 for a loss – to go along with 15 QB hurries and two sacks…Currently playing center on varsity basketball team for the Cavaliers, which he did as a sophomore as well. High School: University Lab, coached by Chad Mahaffey.. 247Sports.com four-star prospect…Ranked as the #209 prospect nationally, the #8 athlete nationally, and the #12 overall prospect in the state of Louisiana…PrepStar Magazine four-star prospect, ranked #214 nationally, #15 ATH, and a member of the Top 350 All-American Team…ESPN four-star prospect, #103 prospect nationally, #10 ATH in the nation and #6 overall prospect in Louisiana…Rivals.com four-star prospect, #22 ATH nationally and #17 prospect from Louisiana…Led U-High to 27 straight wins, a No. 16 national ranking (USA Today Super 25) and its second-straight LHSAA Division II State Title in 2018, hauling in an incredible 17-yard touchdown pass in the end zone on 4th and 6…Played wide receiver primarily for the Cubs, but also safety and outside linebacker and has the opportunity to play multiple positions at the next level…Recorded 16 catches for 249 yards and three touchdowns by midseason of his senior year…Named to The Advocate’s 2017 All-District 6-3A Second Team offense as a junior…Hauled in 27 catches for 354 yards and four touchdowns in the regular season in 2017….Son of Reggie Tongue, who played nine seasons as an NFL safety for the Kansas City Chiefs, Seattle Seahawks and New York Jets. High School: Bishop Hendricken, coached by Keith Croft…Selected to represent the East in the 2019 All-America Bowl…247Sports.com four-star prospect…Ranked as the #1 prospect in Rhode Island, #15 offensive tackle nationally, and #138 overall player…PrepStar Magazine four-star prospect, ranked #89 nationally, #13 OT, and member of All-East Team…ESPN.com four-star prospect, ranked 99th overall player, #12 offensive tackle nationally, #9 in Northeast and #1 in Rhode Island…Rivals.com four-star prospect, ranked #20 offensive tackle nationally and #188 player overall…One of four members of Georgia’s ESPN 300 offensive linemen in the 2019 class…Football University’s 2019 All-Top Gun Team, one of six offensive linemen… One of 14 players to earn the 2018 Football University GRIT Award at the Top Gun Showcase…Selected as one of 100 players nationally invited to the All-American high school combine in San Antonio…Providence First-Team All-State selection his junior year…Guided the Hawks to back-to-back Rhode Island State Championship Super Bowl appearances, earning the Rhode Island state title in 2018 after an undefeated division slate and an 8-1 record as a senior…Also played on the defensive line his junior year with 45 tackles and two sacks…Three-time state champion in indoor track and field…As a junior, contributed a second-place finish in shot put for the team’s 24th-straight title…Teammate of University of Michigan freshman defensive lineman Kwity Paye. High School: Upson-Lee, coached by Justin Elder…Selected to represent the East in the 2019 All-American Bowl…247Sports.com five-star prospect…Ranked as the #2 defensive tackle nationally, the #24 overall prospect nationally and the #5 prospect in Georgia… Rivals.com four-star prospect, ranked #40 nationally, the #4 SDE and #6 in the state…PrepStar Magazine five-star prospect, #18 prospect nationally, #4 DT….ESPN.com four-star prospect, #51 nationally, #6 DE and #8 in Georgia…Played multiple positions on the defensive line for the Knights, as well as tight end and running back…Awarded Lineman of the Week in week nine by the Touchdown Club of Atlanta for his performance against West Laurens, which included 11 tackles, two touchdown receptions and a touchdown run…Named to the USA Today 2018 Preseason All-USA First Team defense…Tabbed for the AJC 2018 Preseason Super 11 along with Georgia signees Dominick Blaylock and Trezmen Marshall…Named to the Maxwell Football Club’s 2018 National High School Defensive Player of the Year watch list in the preseason…Selected to represent Team Overdrive in Nike’s The Opening 2018 Finals and compete in the Final Five Lineman Challenge…Listed to the USA Today 2017 Georgia All-USA Second Team defense…Named to the GACA South 2017 All-State Class 4A First Team defense, as well as honorable mention by the AJC his junior and sophomore seasons…Racked up 37 solo tackles, three sacks and two forced fumbles as a junior…Has helped lead the Upson-Lee basketball team to a historic 71 straight wins (third-longest in state history), a No. 7 national ranking (Xcellent 25) in 2018 and back-to-back Class 4A titles…As a junior, averaged 12.2 points, 11.9 rebounds and 2.8 blocks per game while complementing current Georgia freshman point guard Tye Fagan…Also competed in the discus throw and shot put for the Upson-Lee track and field team, finishing 8th in the 2018 GHSA Class 4A shot put championships with a throw of 48 feet, 7 inches…Registered an 8-3 record in 2015 at Upson-Lee together with Georgia junior defensive end David Marshall, who has amassed 58 tackles, seven tackles for loss and 3.5 sacks in 32 appearances for the Bulldogs…Walker worked out with Marshall and threw shot put with him…Both were coached in 2015 by Tommy Parks, who also coached former Georgia linebacker and current New York Jet Jordan Jenkins. Hutchinson C.C. (Kan.): Hutchinson Community College, coached by Rion Rhoades…247Sports.com three-star JUCO prospect…Ranked #40 nationally, the #4 JUCO defensive tackle and the #13 JUCO prospect from the state of Georgia…ESPN.com three-star JUCO prospect, the #44 JUCO player overall, the #6 JUCO defensive tackle and a member of the ESPN JC50…Helped Hutchinson to a 9-3 overall record, capped off by a 35-6 victory over Navarro College in the Salt City Bowl…Registered 16 total tackles, two tackles for loss and one sack in 10 games played for the Blue Dragons…Took the same route from high school to Hutchinson and then Georgia as Georgia sophomore defensive lineman Devonte Wyatt, who made 12 tackles in 11 games in his debut season. High School: Liberty County, coached by Kirk Warner…ESPN.com three-star prospect, #54 defensive tackle nationally, #67 overall prospect in Georgia…247Sports.com three-star prospect, #48 defensive tackle nationally, #65 overall prospect in the state…Rivals.com three-star prospect, #37 defensive tackle nationally, #51 overall prospect in the state of Georgia…Named to the All-Region 2-3A First Team defense…Named the Liberty County Football Defensive Player of the Year by MaxPreps.com…Led the Panthers to the 2016 and 2017 GHSA Class 3A semifinals his junior and senior seasons…In addition to football, lettered in basketball at Liberty County…Brother, Tracy White Jr., plays cornerback at Old Dominion…High school teammate of current Georgia sophomore defensive back Richard LeCounte for three seasons at Liberty County. High School: Oxford HS, coached by Ryan Herring…One of two centers selected to play in the 2019 Under Armour All-America Game, but will forego the game to enroll early at Georgia…Also selected to the Alabama-Mississippi All-Star Game…Ranked #18 in USA Today Sports’ Chosen 25…Listed as the top prospect on AL.com’s “A-List”, the top 15 prospects in the state of Alabama…247Sports.com 5-star recruit…The #22 overall prospect in the nation, #1 center, and the #1 recruit in Alabama…PrepStar Magazine five-star prospect, ranked #14 nationally, #1 OC, and a member of the Top 150 Dream Team…Rivals.com 5-star recruit, ranked #23 nationally, #2 in the state of Alabama, and the #1 OC…ESPN.com 5-star recruit, ranked #11 nationally, #1 in his position, #6 in the Southeast, and #2 in the state of Alabama…The fourth addition to Georgia’s class of ESPN 300 offensive linemen…Led Oxford to a 10-3 overall record, 5-2 record in region play and the quarterfinals of the AHSAA Class 6A state playoffs before falling to Clay-Chalkville HS…Paved the way for an explosive Yellow Jacket offense that averaged 37.2 points per game…Named to the USA Today 2018 Preseason All-USA First Team offense and the All-American Second Team offense by MaxPreps…Selected to represent Team Elite in Nike’s The Opening 2018 Finals…Earned an invite to the 2018 Rivals Five-Star Challenge by earning offensive MVP honors at the Atlanta Rivals 3 Stripe camp… Named to the MaxPreps All-American First Team offense his junior and sophomore seasons, and Second Team offense his freshman year…Tabbed for the USA Today 2017 All-State First Team offense…Named to the ASWA All-State Class 6A First Team offense his junior and sophomore seasons…Burst onto the scene at the Atlanta Opening regional and Atlanta Rivals camp following his freshman year in 2016…Started at left tackle for OHS as an eighth grader according to an article by AL.com…Helped lead the Oxford wrestling team to its second-straight 2018 AHSAA Class 6A Duals championship, clinching the final match by pin down and finishing his career with a 45-1 record and 38 pins…Joins Isaiah Wilson (2017), Cade Mays (2018) and Jamaree Salyer (2018) as the five-star offensive linemen signed by Georgia. ATHENS. Ga. — Former Georgia football greats Todd Gurley and Geno Atkins have been selected to play in the 2019 Pro Bowl, the NFL announced Wednesday. This marks the third selection for Gurley and the seventh selection for Atkins. The Pro Bowl will include AFC and NFC All-Stars from 29 different teams and 24 clubs. Players were selected by the consensus votes of fans, players, and coaches. Each group’s vote counted one-third toward determining the 86 Pro Bowl selections announced today. The 2019 Pro Bowl will kick off at 3:00 PM ET on Sunday, January 27, in Orlando, Fla., and will be televised live on ESPN, ESPN Deportes, Disney XD and simulcast on ABC. Roquan Smith: Smith had a team-high 10 tackles and defended one pass for Chicago, which clinched the NFC North title for the first time since 2010. Smith is 14th overall and third among rookies with 107 tackles. He also is sixth among rookies with four sacks. Leonard Floyd: Floyd had two sacks among his six tackles for the Bears. Javon Wims: Wims was a healthy scratch for Chicago. Geno Atkins: Atkins had three sacks and another tackle for loss among his six stops for the Bengals. Atkins is 17th in the NFL with 10 sacks. Shawn Williams: Williams picked up five tackles and defended two passes for Cincinnati. Williams is sixth in the league with four interceptions. Cordy Glenn and Clint Boling: Glenn and Boling started at left tackle and left guard, respectively, and helped the Bengals roll up 294 total yards. Nick Chubb: Chubb rushed 20 carries for 100 yards as he eclipsed the century mark for the third time this season for Cleveland. Chubb is 12th overall and third among rookies with 860 yards rushing, eighth overall and third among rookies with eight rushing touchdowns, 14th overall and second among rookies with 10 total touchdowns, and fifth among rookies with 60 points. Isaiah McKenzie: McKenzie had six catches for 53 yards, two kickoff returns for 29 yards, two punt returns for 11 yards, and one rush for four yards for Buffalo. Matthew Stafford: Stafford went 22-of-29 for 208 yards and a touchdown for Detroit. Stafford is 15th in the league with 3,395 passing yards and 18th with 19 touchdown passes. Ben Jones: Jones started at center and helped Tennessee accumulate 301 total yards. Lorenzo Carter: Carter had four tackles for New York. Carter is 12th among rookies with three sacks. Alec Ogletree: Ogletree had seven tackles, including one for loss, for the Giants. Ogletree stands fifth in the NFL with five interceptions. John Jenkins: Jenkins was a healthy scratch for New York. Corey Moore: Moore appeared on nine special teams plays for the Colts but did not record any stats. Thomas Davis: Davis recorded 12 tackles and defended one pass for the Panthers. Davis is fourth in the NFL with two fumble recoveries. Benjamin Watson: Watson had a 28-yard reception for the Saints. Watson, who celebrates his birthday today, and the Chargers’ Antonio Gates are the first tight ends in NFL history to have 300 receiving yards at age 38 or older. It has been done just 10 times total by any receiver — five by Jerry Rice, two by Charlie Joiner, and once each by Irving Fryar and now Gates and Watson. Watson has 365 yards on 32 catches this season. Chris Conley: Conley had two catches for 19 yards for Kansas City. Justin Houston: Houston registered five tackles, including 1.5 sacks, for the Chiefs. Houston is fourth in the NFL with two fumble recoveries. Jordan Jenkins: Jenkins had a sack and two quarterback hits for New York. Jenkins is fourth in the NFL with two fumble recoveries. Reshad Jones: Jones picked up four tackles for Miami. Abry Jones: Jones had a sack and two other tackles for loss among his five stops for Jacksonville. David Andrews: Andrews started at center for New England, which accumulated 368 total yards. Sony Michel: Michel carried 13 times for 59 yards for the Patriots. Michel is 19th overall and fourth among rookies with 765 rushing yards, fifth among rookies with five rushing touchdowns, seventh among rookies with five total touchdowns, and 11th among rookies with 30 points. Todd Gurley: Gurley had 12 carries for 48 yards and two touchdowns and he caught 10 passes for 76 yards for Los Angeles. Gurley is first in the NFL with 17 rushing touchdowns and 21 overall touchdowns and second with 1,251 rushing yards and 132 points. Ramik Wilson: Wilson had one tackle for the Rams. ATHENS, Ga. — Georgia senior defensive back Deandre Baker has been named to the 2018 Sporting News All-America First Team. Baker, a Miami, Fla., native, became the first Bulldog to win the Paycom Jim Thorpe Award last week for being nation’s best defensive back in college football. He has also garnered Walter Camp, Associated Press, Sports Illustrated and ESPN.com First Team All-America honors and was named to the Football Writers Association of America (FWAA) Second Team. Baker becomes the first Georgia All-American from the defensive backfield named to the Sporting News’ First Team since safety Greg Blue in 2005. The American Football Coaches Association (AFCA) All-America teams are scheduled to be released on Wednesday.